Please Call for Better Discount. FREE SHIPPING!!!!! This is a custom made 12 foot palapa thatch frame with 2 thatched umbrella covers. These are the authentic made frames and thatching that you see on the beaches of most tropical resorts and bbq island vendors and restaurants. These kits are designed for quick assembly. We Make Our own palapa umbrella kits. We don't have a sub contractor make thatched umbrellas for us that's why we are able to give better prices. Save hundreds of dollars by assembling yourself. Everything is pre drilled, pre cut (except for slats). These palapa umbrella kits come complete with instructions, pinewood poles, all hardware, 2 thatched umbrella top covers, wood slats, rope and center main pole. We use a 6 inch diameter x 10 foot lodge pine pole for our center main pole (we have longer poles for in ground installations). We don't use the 5 inch poles like most companies, because they look to skinny and not as durable for the 9 foot palapa frames. 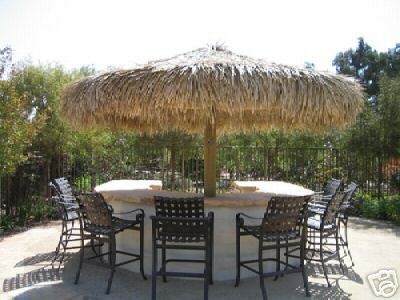 Our palapa thatch kits will last for many years and will withstand winds up to 60-70 mph. These pinewood frames are made of top quality pinewood and will last for years in all types of weather. Everything is super heavy duty, no expense spared. It takes us about 2.5 hour to assemble this palapa thatch kit. Once you assemble it will look just like the picture. These are the same palapa umbrella kits that we sell to Restaurants, Hotels, Amusement - Theme - Water Parks, Film and TV Productions, Exhibits, Tropical Style Homes and Landscaping, and also Island BBQ manufactures. These thatched umbrellas are made to order and ready to ship in no more than 3-4 weeks. All of the products used are top quality for long lasting. We have been building these palapa umbrella kits for years and have already found the best of everything that can be used. Palapa thatch installation is a breeze. Slide main pole into BBQ island, construct the frame, place the pre-woven thatch top. on the frame and enjoy! Our palapa umbrella kits will transform your patio, pool area, yard or commercial property into that paradise we all dream of. If you have any question about our thatched umbrellas, please call 909-370-2700. Rope lights are not included but are available at Home Depot or Lowes. You also get a free care sheet with purchase. BBQ island not included. Shipping is higher to Canada and Hawaii, USA only. 36" round tables are available for $189.00 with free shipping.